Heat 1 inch water (salted if desired) to boiling in 3-quart saucepan. Add cauliflower. Heat to boiling; reduce heat. Cover and simmer about 10 minutes or until crisp-tender; drain. Cool about 20 minutes to room temperature. Place cauliflower on serving platter. 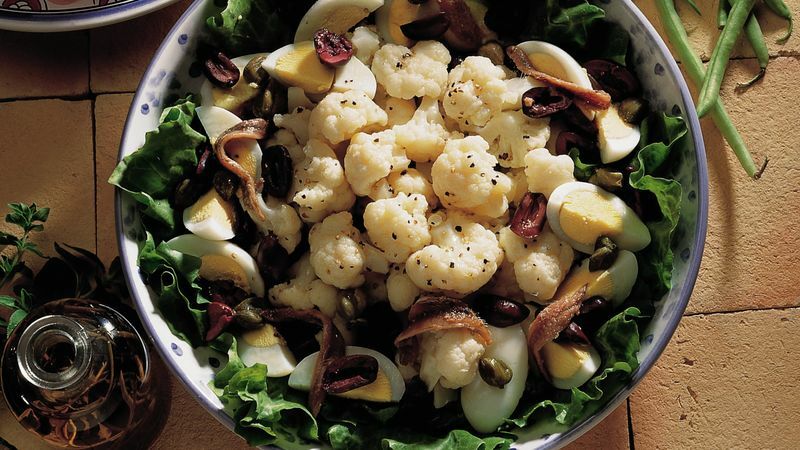 Arrange olives, capers, anchovy fillets and eggs around cauliflower. Mix remaining ingredients; pour over salad. Anchovies are tiny fish that are generally filleted, salt-cured and canned in oil. You can find them in specialty food shops sold flat or rolled. Go ahead and use 2 cups of precut cauliflowerets, if you’d like.